Frontier dangers cannot hold a candle to the risks one woman takes by falling in love ** ** In an act of brave defiance, Tamsen Littlejohn escapes the life her harsh stepfather has forced upon her. Forsaking security and an arranged marriage, she enlists frontiersman Jesse Bird to guide her to the Watauga settlement in western North Carolina. But shedding her old life doesn’t come without cost. As the two cross a vast mountain wilderness, Tamsen faces hardships that test the limits of her faith and endurance. Convinced that Tamsen has been kidnapped, wealthy suitor Ambrose Kincaid follows after her, in company with her equally determined stepfather. With trouble in pursuit, Tamsen and Jesse find themselves thrust into the conflict of a divided community of Overmountain settlers. The State of Franklin has been declared, but many remain loyal to North Carolina. With one life left behind and chaos on the horizon, Tamsen struggles to adapt to a life for which she was never prepared. But could this challenging frontier life be what her soul has longed for, what God has been leading her toward? As pursuit draws ever nearer, will her faith see her through the greatest danger of all—loving a man who has risked everything for her? 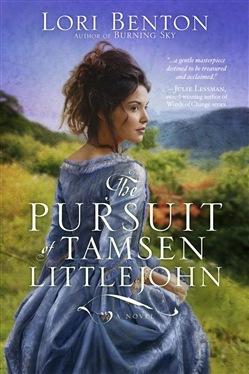 Acquista The Pursuit of Tamsen Littlejohn in Epub: dopo aver letto l’ebook The Pursuit of Tamsen Littlejohn di Lori Benton ti invitiamo a lasciarci una Recensione qui sotto: sarà utile agli utenti che non abbiano ancora letto questo libro e che vogliano avere delle opinioni altrui. L’opinione su di un libro è molto soggettiva e per questo leggere eventuali recensioni negative non ci dovrà frenare dall’acquisto, anzi dovrà spingerci ad acquistare il libro in fretta per poter dire la nostra ed eventualmente smentire quanto commentato da altri, contribuendo ad arricchire più possibile i commenti e dare sempre più spunti di confronto al pubblico online.